Lot Detail - 2012 LOS ANGELES KINGS STANLEY CUP CHAMPIONS STERLING SILVER RING BY TIFFANY & CO.
2012 LOS ANGELES KINGS STANLEY CUP CHAMPIONS STERLING SILVER RING BY TIFFANY & CO.
For 43 springs, they watched other players pick up the Stanley Cup and weep with joy and share the moment with their families and teammates and know that their names would be inscribed on the trophy for all time. Since arriving in the NHL with the first wave of expansion in 1967-68, the Los Angeles Kings and their fans watched others call themselves champions and wondered when, or even if, it would be their turn. Their turn finally came in 2012. Not only did the Los Angeles Kings win the Cup and get their rings, they were finally able to hang their championship banner in the rafters of Staples Center. 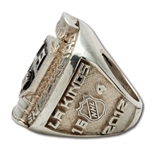 Presented here is a 2012 Los Angeles Kings Stanley Cup Champions ring. 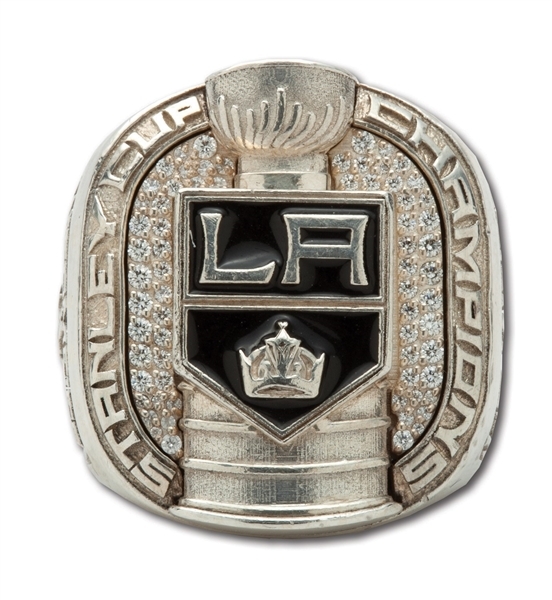 Crafted by Tiffany & Co. in sterling silver, the face of the ring includes a bevy of round brilliant pave set diamonds flanking the Los Angeles Kings crest atop the Stanley Cup. The proclamation “STANLEY CUP CHAMPIONS” is set around the bezel. 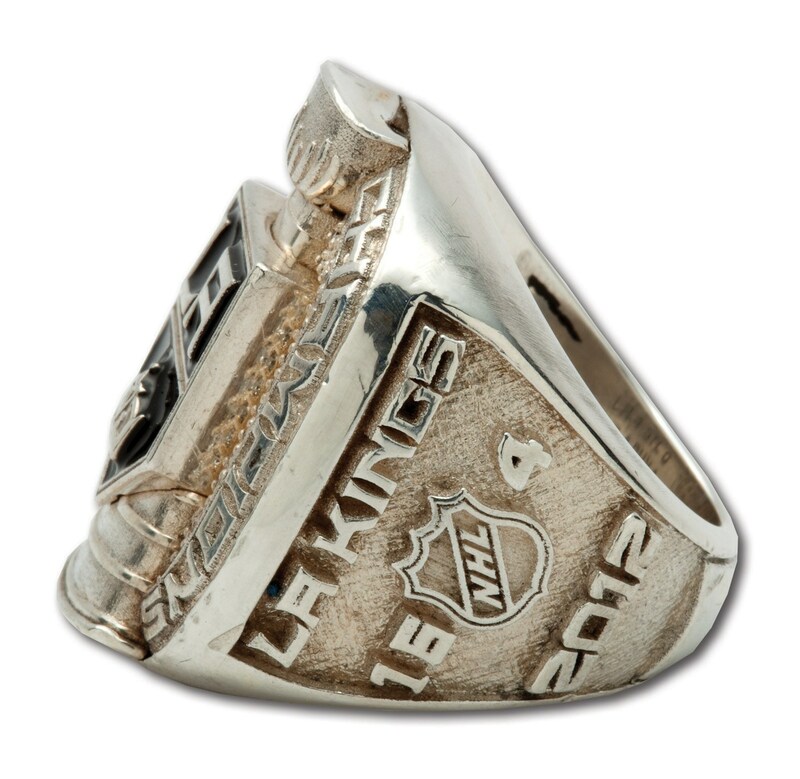 The ring’s shanks celebrate the Kings’ historic 2012 season. The LA Kings iconic crown and recipient’s name (“Weidmeier”) in raised letters appear on one shank; and the LA Kings team name, the NHL logo, 16/4 record and year (2012) appear on the other shank. 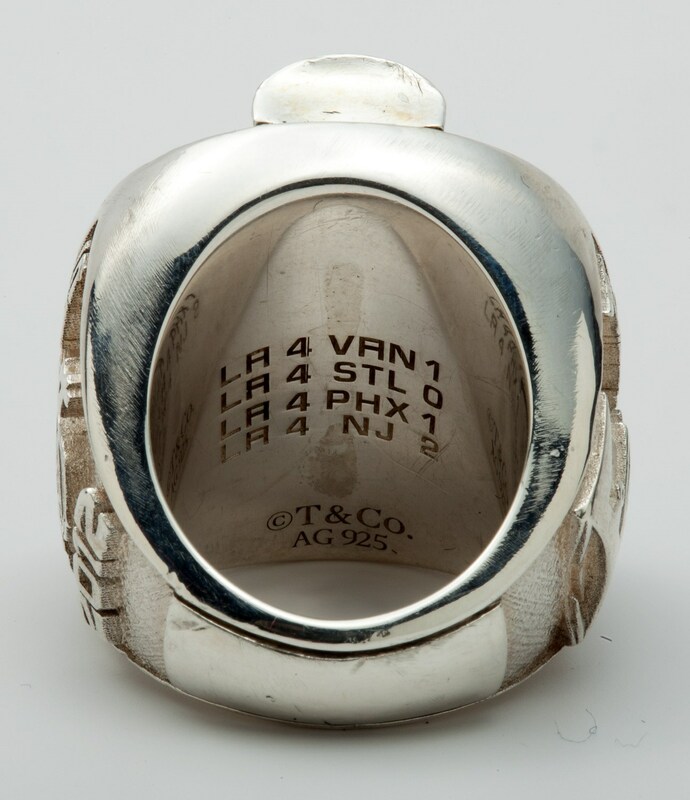 Stamping inside the band recounts the Kings’ road to the cup, “LA 4 VAN 1, LA 4 STL 0, LA 4 PHX 1, LA 4 NJ 2.” Tiffany & Co. stamping is inside the band as well. 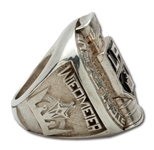 Ring shows light to medium wear. Size 7.5.